This farmstead cheddar is as memorable and savory as home-cooked meal. 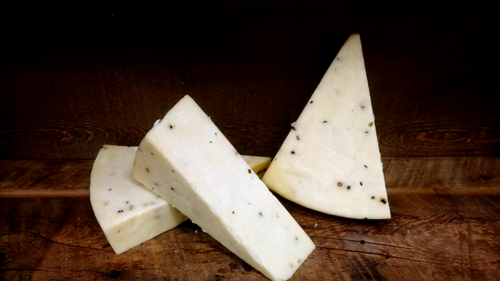 Made from our premium Holstein cow milk infused with cracked black pepper & chives, this cheese features a harmonious combination of creaminess, tang and a hint of spice. At Heber Valley Artisan Cheese, we want to make sure you receive your products in the BEST possible condition. Because cheese is a perishable item, our shipping costs include insulated packing and ice packs, which in turn adds a bit more weight to your package (jams excluded). Keep in mind that ordering more than one (6 oz) cheese will be more cost effective. We recommend ordering at least three to five cheeses per order. All our products are shipped from our farm in Midway, Utah. During the WARM summer months, any customer ordering OUTSIDE OF THE INTERMOUNTAIN WEST should invest in a faster method (3-day UPS or 2-Day Fedex) to ensure your product arrives in a timely manner. Typical shipping days include Monday, Tuesday & Wednesday - this ensures your product will not sit in a non-refrigerated warehouse or truck over the weekend. If in the rare occurrence your cheese arrives in a poor condition, please contact our Customer Service Representative, Amber Himmer, immediately at 435-671-8062. This farmstead sharp cheddar delivers bite and intensity. Made from our premium Holstein cow milk, and aged for 2 years, the cheese is the perfect combination of tang, zip and crystalline texture. This farmstead cheddar features a soft creamy texture with an extraordinary kick. 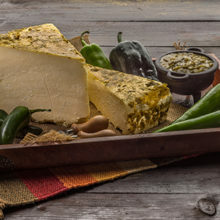 Made from our premium Holstein cow milk and marinated with our handcrafted verde salsa, this cheese features amazing chili notes on the interior with an explosion of heat and spice on the rind. 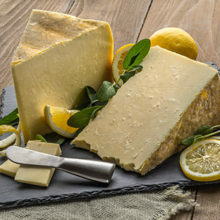 This farmstead aged cheddar will have you wondering if it is a cheese or a lemon meringue pie. Made with our premium Holstein cow milk and hand rubbed with lemon sage, this cheese features unique citrus flavor notes which give your pallet a refreshing sensation. 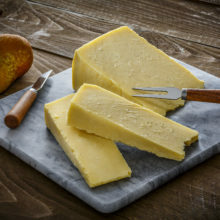 This farmstead cheddar brings impeccable flavor, much like taking a bite of vanilla ice cream that never melts. 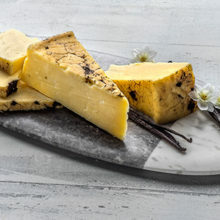 Made from our premium Holstein cow milk and hand rubbed with gourmet vanilla beans, the vanilla sensation will linger on your pallet as the cheese notes fade leaving a very pleasant mouth feel. Flavor Notes: black cherry, sweet almond, floral vanilla, pineapple, lemon zest, rose petal, anise, kola nut, nutmeg.